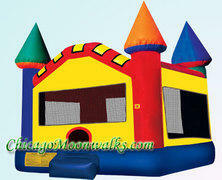 This large Castle 2 moonwalk is 360-degrees of brilliant and joyful regal fun for all young royalty! This majestic moonwalk is fit for any king or queen, with colors of blue, green, red, yellow and orange, along with four tall spires to make any palatial party a success. Great for all sorts of events! Please note area required for setup is 20' x 20'. Actual Size: 17'L x 16'W x 13'H.